It’s always a good time when you’ve got your sisters. N.Y.C. twin DJs Angel + Dren have been taking over the city with their high-energy sets that span hip-hop, R&B, and pop with Caribbean influences. This past March, they brought that feel-good blend to FADER FORT in Austin, Texas, where they warmed up the crowd for sets by Young M.A, 2 Chainz, Cardi B, and more. Alongside music, the sisters are also known for promoting wellness by encouraging others to get active and stay in shape. So it should come as no surprise that the Bronx natives have put together a lively FADER Mix perfect for the gym, as well as the pre-game — and the game itself. 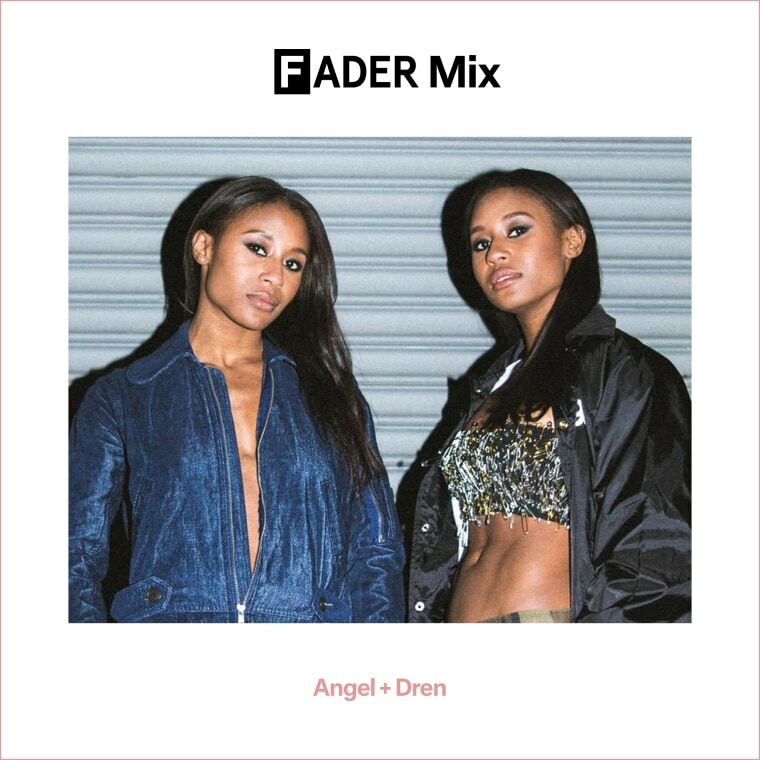 Get to know Angel + Dren below, then grab your friends, sprinkle on some eyeshadow, and get your life to their sultry mix that’s guaranteed to make you move. DREN: We’re at our mom’s house in the Bronx — the same apartment we grew up in. Angel and I shared a room growing up, but now there’s only one of two twin beds left in the room. Right now we’re huddled on the the twin bed answering these questions on Google Docs. The sheets are green with pink anchors — very preppy — and I’m staring at a Hello Kitty piggy bank in the corner of my eye. I also see the mail that I conveniently don’t forward to my apartment. DREN: We want to put out mixes that people can listen to more than once, so they can catch a vibe at work, in the gym, on the train or wherever. We also like for the mix not to be linear. We want it to move and have ups and downs and drops and breaks and moments of interlude because those are the elements that make mixes more lively. We put a lot of care into the vibe and flow of the mixes. We honestly probably even overthink it, but it’s all in the details for us. It has a little bit of everything. ANGEL: We grew up in the Bronx in a very Jamaican enclave. All the windows in the house could be closed and you still couldn’t block out the music — reggae, dancehall, hip-hop. I’m actually a heavy sleeper now because it was that or no sleep. Also, our Antiguan landlord lived under us and blasted calypso and soca so loud that the floor would shake. And we couldn’t complain because it was his house. My uncle lived with us too, and he was young and had just moved to the States so he would play all the latest reggae and dancehall. That’s when I first started hearing hip-hop too. He came here, got some Jordan’s and a hightop fade quick and started listening to that good ‘90s hip-hop and R&B. DREN: True, I actually remember him taking us with him to like six stores in search of a D’Angelo CD. How do you guys decide on what songs to play during live sets? ANGEL: We split our sets up and alternate every 30 min. I like that because it’s new energy every half hour. DREN: I ask myself which track is going to elevate the party, and I play accordingly. But I also like to drop in remixes we’ve made [or] found on SoundCloud amongst bangers so that people know what we’re into at the moment. Lastly, I’m waiting for someone to allow me to host a bashment so that I can release all the dancehall deep cuts I have in my library. DREN: Still formulating the goals for this year, but I know we’re taking the time to focus more on production. And finally, what is your favorite dish to cook and how do you make it? ANGEL: I got my curry shrimp on lockdown. DREN: Probably plantain because it can been cooked in like 100 ways, but I also make a wicked salmon dish.